BMMP teams up with Pro Rider! Blog/News / BMMP teams up with Pro Rider! Great news for road riders looking to further develop their skills! Bruce McLaren Motorsport Park are teaming up with Pro Rider to bring you track based training and coaching. Hone your skills and enhance your knowledge in a relaxed, friendly and safe environment. Pro Rider’s directors Karel Pavich and Howard Mansell have ridden bikes all their lives and are leaders in the NZ motorcycle scene. In 2006 Karel was the first woman in NZ to win a national road racing championship and Howard is a former National Vice-President of Ulysses. Their passion for rider safety, education and having fun on a bike, was instrumental when they helped develop the Ride Forever programme and syllabus with ACC, as well as the CBTA Licence Assessments in conjunction with NZTA. These days cater for all road riders and all types of road bikes. We encourage newer riders to experience the safety, fun and learning this day has to offer. More experienced road riders will gain a huge amount from honing their cornering, braking and steering skills to a more advanced level. The Pro Rider Instructors will help you get the most out of your day, taking your riding skills and knowledge to the next level. Suitable for any style of bike: SPORTS, TOURER, CRUISER! You bring your bike and Pro Rider will show you how to have more fun on it! Need to get your Motorcycle licence? Book your Basic Handling Skills (held at BMMP on same day). 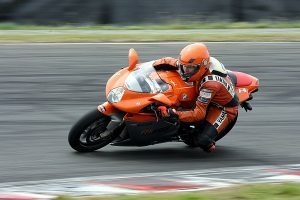 Develop your skills and have a blast with Pro Rider at Bruce McLaren Motorsport Park! Visit their website and book today!